Probably never wanted anything more in life than an apple cider churro. I don’t think I’ve been this excited for the first day of fall since I was maybe 18 or 19 years old. I am SO EXCITED. I feel like I’ve been in major fall mode for weeks now and it’s been the first year in a decade that I’ve actually been okay to see summer go. Don’t get me wrong, I mean, I looooove all four seasons and really hate wishing days away from them. But right now, I’ve just been in such a crazy autumn spiral that I’m practically past Thanksgiving in my own wacky brain. Now seriously, what better recipe can ring in fall than this?! We are talking freaking apple cider churros. Apple cider! 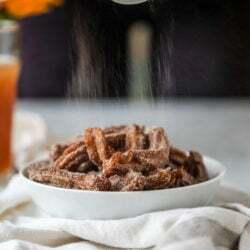 This churro recipe! As if I didn’t already love the stuff enough. First up, are you a hot cider or a cold cider drinker? I’m definitely a cold cider drinker, but that’s just because I prefer everything cold. I don’t go crazy over hot liquids. I even drink my coffee iced in the winter. SOMETIMES I’m into hot coffee but I’m very very rarely into hot cider. Pretty sure I burnt the ever living heck out of my taste buds on hot apple cider at a bonfire when I was in, like, seventh grade and ever since then? I’ve been over it. ALSO. Can we discuss how magical those bonfires and hayrides were in middle school? I remember going on them whether it was for a school or church function or something or even a birthday party and just being so giddy about my tween crush and trying to get their attention and wanting them to sit next to me. The whole evening would be full of stereotypical yet perfectly nostalgic fall memories for me that it’s no wonder why I lose my ish over fall. The chilly and cool weather, the actual hayride that started at dusk and returned us to a huge bonfire in the dark with s’mores and snacks and said cider that gave my mouth third degree burns. I seriously remember it like it was yesterday. Last week I saw on article about how the scent and flavor of pumpkin is super nostalgic for people and triggers them to get all crazy and pumped about fall, so clearly I must fall into that category. Except I include apple cider too! 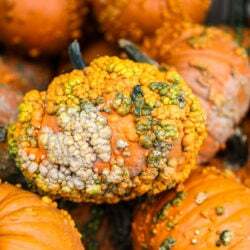 When I was growing up, my mom never made anything with pumpkin. My grandma would make a pumpkin pie or two at Thanksgiving but pumpkin in the 90s wasn’t ANYTHING like pumpkin is now. We would, however, have apple cider for a good month or two. It’s funny because I’ve never liked any sort of juice or anything like that to drink. But give me apple cider? Hello. I might drown in it. SO GOOD. Obviously you now know why I just had to go make churros with said cider. The churro dough is made with apple cider, but I used a hard cider for the caramel sauce. AH. So freaking good. We could not stop dipping and eating and stealing churros from the plate. I also coated the churros in a mix of sugar + apple pie spice. My actual dream, I think. Just a bit crisp on the outside and then soft and fluffy on the inside. I mean, how does something this wonderful even exist? And it’s not like they NEED to be dipped in the caramel. The caramel is made with hard cider… or cider beer as some people call it. They are totally and completely insane and amazing on their own. But what good would I be if I wasn’t trashing things up and making them seem horrifyingly ridiculous? Fill a heavy bottomed saucepan or pot with a few inches of vegetable oil and heat over medium-low heat. Attach a candy thermometer – you want the oil to be 375 degrees F.
In a saucepan, combine the apple cider, 2 tablespoons sugar, salt and 2 tablespoons oil. Bring the mixture to a boil. Place the flour in a large bowl, then (carefully!) add the boiling cider mixture to it. Stir until a soft dough forms. Fill a piping bag fitted with a star piping tip with the dough. Once the oil is hot, pipe 3 to 4 inch pieces of the dough into the oil, snipping the dough after each pipe. Fry for 2 to 3 minutes each, just until golden brown. Be careful to check your oil and make sure it’s not getting too cool or too hot! Place the fried churros on a paper towel to drain any excess grease. Whisk together the sugar and pie spice. Toss each churro with the sugar spice mixture and place them on a plate. Serve immediately with the caramel! Combine the sugar, butter, cider, cream and salt in a saucepan over medium heat. Whisk until the sugar dissolves, then let the mixture come to a simmer. It will bubble up, so watch closely – but you don’t want it to bubble over! Lower the heat if it threatens to do so. Let it simmer for 5 minutes. Remove it from the heat and stir in the vanilla extract. Let it sit for a few minutes to thicken. If it gets too thick, heat it over low heat or in the microwave until it’s thinner for dipping again. I’ve been waiting for this recipe since you posted it on Instagram!! Going to make these this weekend. Who can say no to churros? right?! let me know if you like them! i literally audibly said “omg shut up” when i saw this just now. SO GOOD. this is everything you could ever want in a weekend, right?!??!?! Out of curiosity, why “beer caramel” where there’s no beer? cider beer! or hard cider. i wrote it in the post, but some people refer to hard cider as cider beer! It slipped to my attention. Nice to hear from you! As you can appreciate, I am following your blog from the beginning and still enjoying it each morning. I still hope you will have a TV cooking show someday or be invited to Rachael’s! Do you think apple juice (or alcoholic cider) would be an okay substitute in the churros? I live abroad and they don’t have cider like we do in the US. Today I learned you can make churros at home! ;). I’m totally I got cider person. I’m a hot everything person though. I’ll buy a jug of apple cider and just heat a mug of it in the microwave even. And totally! Middle school bonfires and hayrides were the best! Always cold cider, always! 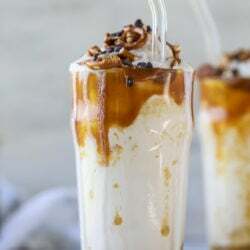 Cider caramel sounds insane and I want pour it all over my life! We have our annual apple orchard trip planned for this weekend so this was perfectly timed my friend! My fav part about apple orchard season is the warm apple cider donuts…. and churros are just extra crispy cake donut sticks, which is to say donuts on roids, AKA HEAVEN! All I want in life is this, forever and ever, amen. we are planning on going this weekend too!!! i can’t wait! Yum! Those look just like the ones at the fair, but with sauce!!! How long do these keep? These would be the PERFECT party food (going to a costume party in a few weeks) – can I pack these up and bring them with me?